On a recent visit to my mother's, I started rummaging through old books (nothing ever gets thrown out which is comforting), hoping to find something that I'd forgotten about as an adult but had been intimately familiar with as a child. There's that rush of confused recognition as your brain identifies the object it the only way it knows how: the same way you saw it as a child. 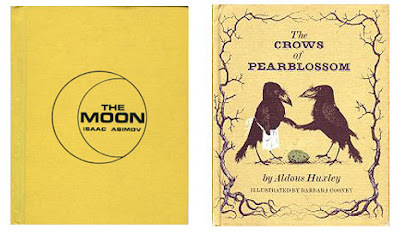 But my adult brain noticed something this time around that really surprised me- the unexpected authors of two children's books: Isaac Asimov (The Moon, Follett, 1966) and Aldous Huxley (The Crows of Pearblossom, 1967, Random House, oop). Huxley's book was one of my favorites, about a crow couple troubled by a snake that keeps eating their eggs before they can hatch. They dispose of the snake in a very clever, and gruesome way, darkly illustrated by Barbara Cooney. The Moon was my brother's and, as filmmaker nonpareil, David Zellner, astutely pointed out to me, it was published two years before Kubrick's 2001. 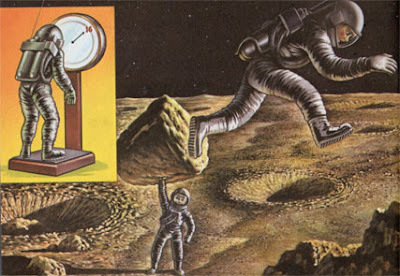 I like that the main activities upon reaching the moon are bounding around playfully, lifting giant boulders and getting weighed. 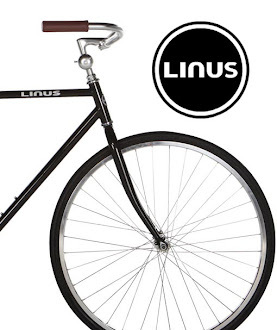 It's like a carnival!